Iceland Moss Liquid Extract, Iceland Moss (Cetraria Islandica) Whole Plant Tincture Features and description: NON GMO! Gluten Free! Highest Strength Iceland Moss liquid extract! Iceland Moss liquid extract contains ONLY natural ingredients! High Q.. 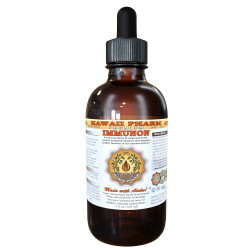 Immune Support Liquid Extract, Immune System Herbal Features and description: NON GMO! Gluten Free! Highest Strength Immune Support liquid extract! Immune Support liquid extract contains ONLY natural ingredients! High Quali..
IMMUNON - Hawaii Pharm Absolutely Natural Premium Quality Liquid Extract Herbal Supplement A delicious blend of medicinal herbs - natural immunity boosters that supports healthy function of the immune system. * Features and description: NO..
Inchplant Liquid Extract, Dried herb (Tradescantia Zebrina) Tincture Features and description: NON GMO! Gluten Free! We produced this extract using a cold maceration method of extraction to ensure that the broad spectrum of therapeutic plant compo..
Indian Madder Liquid Extract, Dried root (Rubia Cordifolia) Tincture Features and description: NON GMO! Gluten Free! We produced this extract using a cold maceration method of extraction to ensure that the broad spectrum of therapeutic plant compo..
Indian Mallow Liquid Extract, Dried seed (Abutilon Indicum) Tincture Features and description: NON GMO! Gluten Free! We produced this extract using a cold maceration method of extraction to ensure that the broad spectrum of therapeutic plant compo..
Indigo Liquid Extract, Dried leaf (Isatis Tinctoria) Tincture Features and description: NON GMO! Gluten Free! We produced this extract using a cold maceration method of extraction to ensure that the broad spectrum of therapeutic plant compounds - ..
Iphigenia Liquid Extract, Dried rhizome (Iphigenia Indica) Tincture Features and description: NON GMO! Gluten Free! We produced this extract using a cold maceration method of extraction to ensure that the broad spectrum of therapeutic plant compou..
Irish Moss Liquid Extract, Irish Moss (Chondrus Crispus) Powderer and Dried Tincture Features and description: NON GMO! Gluten Free! Highest Strength Irish Moss liquid extract! Irish Moss liquid extract contains ONLY natural ingredients! High Qual..
Iron Care Liquid Extract, Iron Herbal Features and description: NON GMO! Gluten Free! Highest Strength Iron Care liquid extract! Iron Care liquid extract contains ONLY natural ingredients! High Quality Iron Care liquid extr..